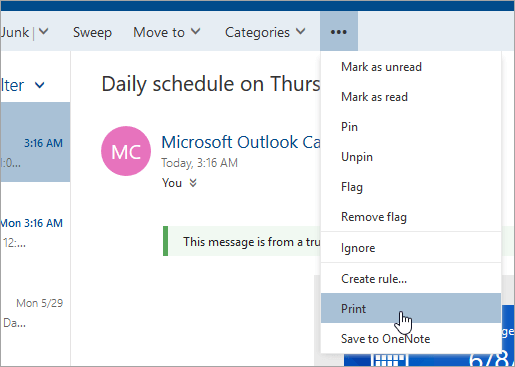 You can print email messages, attachments, and calendars in Outlook on the web. A preview of your message will open. At the top of the window, select Print. In the Printer dialog box, choose the printer you want to use, and select Print. 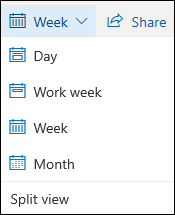 You can print a calendar view in Outlook on the web. You can print a calendar view—or an agenda—in Outlook on the web. Choose the Day, Work week, Week, or Month view in the upper-right corner of the window. A preview of your calendar will open in a new window. Choose the view, layout, and date range you want to print. If you want details about the items on your calendar, such as meeting attendees, select the Print detailed agenda and calendar check box. Select Print.